If Dr. Trombka recommends a crown, it’s probably to correct one of these conditions. Alpine Dentals’ primary concern, like yours, is helping you keep your teeth healthy and your smile bright! Crowns or Bridges vs. Dental Implants? Porcelain, ceramic or glass-like fillings and crowns. Porcelain is fused to an underlying metal structure to provide strength to a filling, crown or bridge. Alloy of gold, copper and other metals resulting in a strong, effective filling, crown or bridge. Alloys of non-noble metals with silver appearance resulting in high strength crowns and bridges. Inlays, onlays, crowns and aesthetic veneers. Crowns and fixed bridges. Inlays, onlays, crowns and fixed bridges. 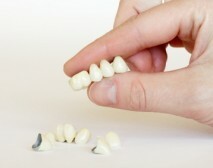 Crowns, fixed bridges and partial dentures. Sealing ability depends on materials, underlying tooth structure and procedure used for placement. The commonly used methods used for placement provide a good seal against leakage. The incidence of recurrent decay is similar to other restorative procedures. Brittle material, may fracture under heavy biting loads. Strength depends greatly on quality of bond to underlying tooth structure. Very strong and durable. High corrosion resistance prevents tarnishing; high strength and toughness resist fracture and wear. These are multiple step procedures requiring highly accurate clinical and laboratory processing. Most restorations require multiple appointments and laboratory fabrication. Moderate resistance to fracture in high-load restorations. Low resistance to fracture. Low to moderate resistance to fracture. Highly resistant to wear, but porcelain can rapidly wear opposing teeth if its surface becomes rough. Highly resistant to wear, but porcelain can rapidly wear opposing teeth if its surface becomes rough. Resistant to wear and gentle to opposing teeth. Resistant to wear and gentle to opposing teeth. Prone to fracture when placed under tension or on impact. Porcelain is prone to impact fracture; the metal has high strength. Highly resistant to fracture.